After blogging that Shortform mockup, I kept finding myself needing the app itself, so I went ahead and started writing it. It’s very much a draft and not polished, but the core is there, and it’s usable enough that I turn to it quite often. Notes are autosaved to a folder specified in preferences. Notes are reopened when you open the app, like with Stickies. Console. I made a first failed attempt (which messed all the window layout up) and need to try again. Title bars. I’ve decided I don’t actually want them — they look nice, but since you can drag a note using the margin on any side of the window, and since you can use keyboard shortcuts or the menu item to close the current note, the title bars aren’t really necessary. Note that this is my first OS X app, so I’ve undoubtedly flubbed a number of things. But I do have to say that Cocoa is a very nice framework to work with — I was able to get to this point far more quickly than I expected to. And Objective-C is — dare I say it — growing on me a little. Lately I’ve been itching for a way in OS X to quickly create temporary sticky notes but with Markdown support and with decent text processing (regex find-and-replace, etc.) and with the ability to type first and act later (like Drafts for iOS). The default Stickies app doesn’t really fit the bill (and it isn’t pretty). Console and reusable actions. In the upper left note, you can see a console at the bottom. It’s a command line for text editing, basically. There’d be built-in commands (like replace or trim or what have you) along with ways to send the text elsewhere (email and web services being the two main ones I’d use). You would also be able to save a sequence of commands into a reusable action. Keyboard shortcuts. Lots of configurable shortcuts — new note, new note with clipboard contents automatically pasted in, shortcuts for custom actions, etc. And a global shortcut to focus the app. Markdown preview. 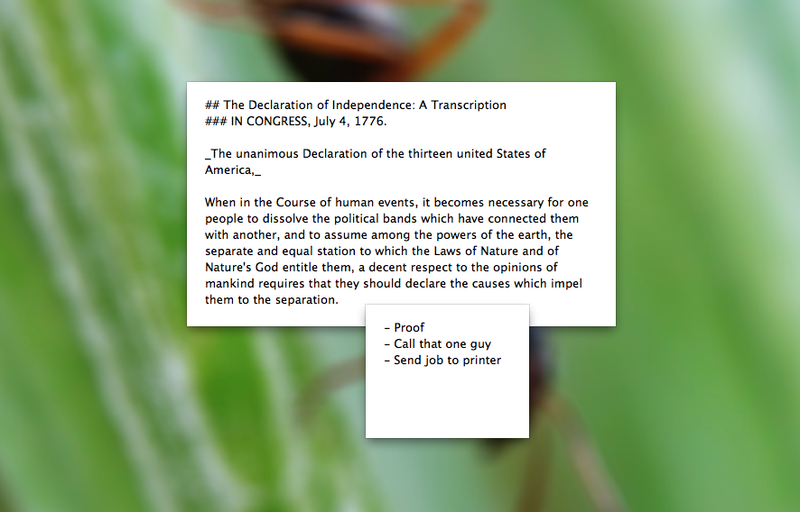 The middle note (with the green header) shows a preview (processed through Markdown to HTML with some CSS). 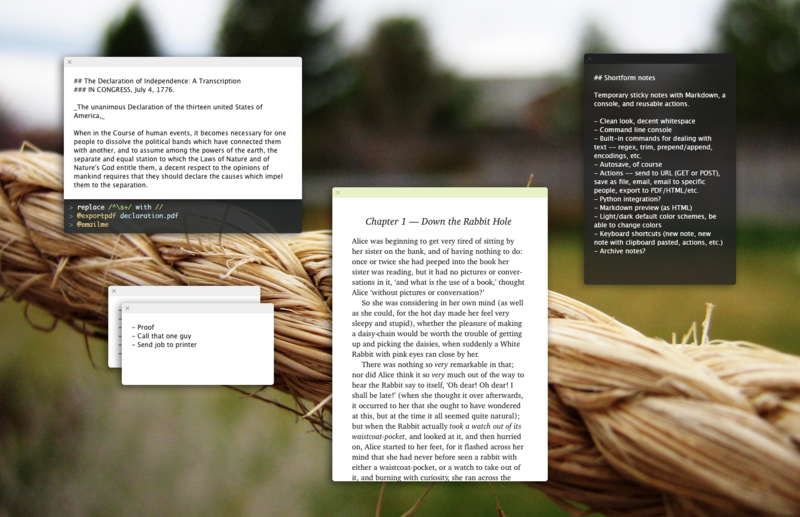 I’m thinking notes could be in either edit mode and preview mode, rather than having two separate windows. Quick text processing. I often need to do a quick regex on a snippet of text — adding hyphens to the beginning of a list of things, for example. Temporary notes while I’m working on something. Stuff I need to write down but don’t care to keep in a longer-term notebook. That’s how I use Stickies right now. Quick entry for blog posts, etc. I love Drafts on iOS. Type first, then do what you need to do with it. It’s particularly useful with web services — I can type a note, then send it to whichever one of my Vinci notebooks I want. Anyway, at this point it’s just a mockup. If I do end up building it someday, I’ll let y’all know.